One of our favorite things about the summer is being able to hold Wukkout!® classes outside! We've got another one coming up for you on Friday July 20th; join us for a Wukkout!® class in Lincoln Terrace Park, Brooklyn, followed by an outdoor movie screening of X-Men: Apocalypse. In addition to the class, there will be live music, DJ, additional fitness sessions and Caribbean arts & crafts the whole family can enjoy. The entire event is free and open to the public so tell a friend to tell a friend and see you under the stars! Further details below. Special thank you to Senator Jesse Hamilton, WIADCA, HCC, Emblem Health and NYC Parks for making this event possible. 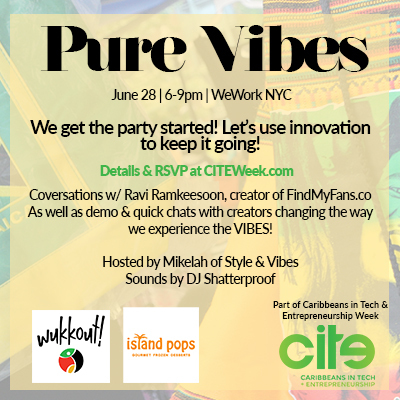 We are thrilled to have been invited to participate in Caribbeans in Tech & Entrepreneurship Week's "Pure Vibes" event on Thursday June 28th. Founder, Krista Martins, alongside Wukkout!® Instructor, Tyrone, will be doing a short demo as well as sharing a little bit about Wukkout!® and all things Caribbean. Additionally, the keynote speaker will be app developer, Ravi Ramkeesoon and music will be provided by DJ Shatter Proof. The event is hosted by Mikelah of Style & Vibes. More details and RSVP info below. Cost: FREE but RSVP required. If you are unable to attend but would like to get a glimpse of the night's festivities, click here to join in on the live stream for the evening. June is Caribbean-American Heritage Month. A time to celebrate and acknowledge Americans from the Caribbean Diaspora. We are back again this year for the 2nd annual Caribbeans In Tech and Entrepreneurship Week , also know as CITE Week. A week filled with workshops, demos, expos, networking opportunities, music, and most of all delicious food! Join us for good times from June 25th - 30 as we celebrate, network with, and explore Caribbean Techies and Entrepreneurs. All events will be live streamed. So that anyone anywhere in the diaspora can join! 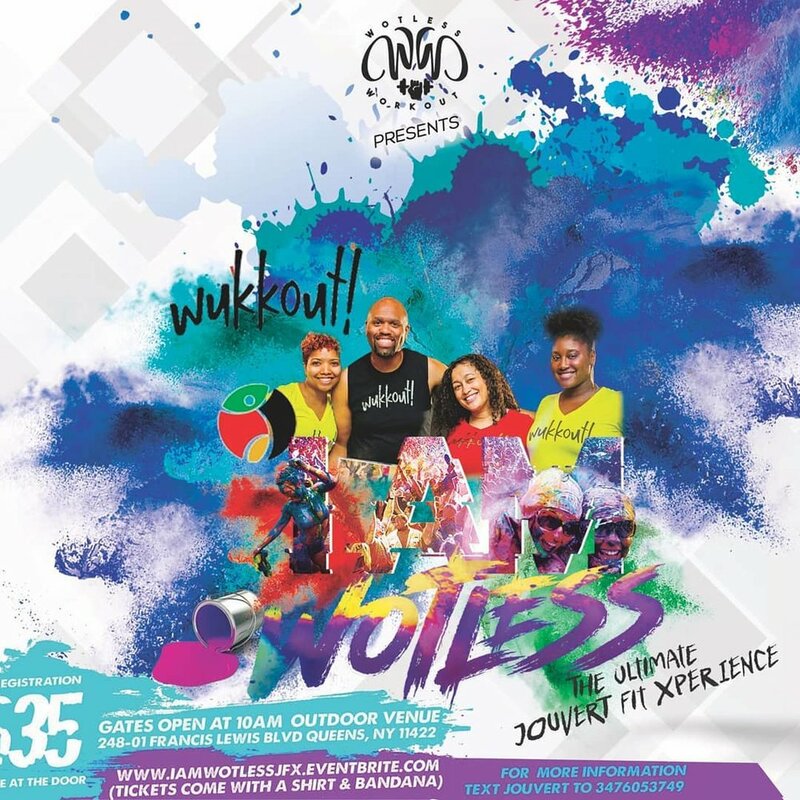 Wukkout!® is excited to be a part of "I AM WOTLESS, a Jouvert Fit Experience," hosted by Wotless Workout. Join Wukkout!® Instructors, Ariana and Allie as we bring the Wukkout!® bacchanal to Queens for a fitness experience like no other. Join us for a 3 hour outdoor workout alongside some of your favorite instructors from the NYC area. Did we mention this would be jouvert?? There will be paint and there will be powder, so be ready! Get your early bird tickets now at the link below and be sure to enter promotional code WUKKOUT. You won't want to miss this. You won't want to miss this. Get your tickets now and remember to enter promotional code WUKKOUT. Original article published in the 1.27.2017 edition of Caribbean Life News and on caribbeanlifenews.com. Wukkout!® founder Krista Martins had the pleasure of sitting down and speaking with reporter Alexandra Simon of Caribbean Life News. To read the full article, click here. The feature also appeared in the 1.27.2017 print edition and can be found at West Indian stores and restaurants throughout the five boroughs. If you'd like to view a copy of the print edition, you'll find us here on page 53. Thank you Alex!